Cesar Henriquez, Chief of Police of Peru, thanked Yekaterinburg and USUE for the support and help provided, "You have spent a lot of time and effort to organize this event. We felt at home, we were given great respect, and treated very kindly." "The long-term contribution of USUE to the international cooperation was appreciated, and we were offered to open a temporary diplomatic mission for the period of the World Cup. We are glad to be useful to our country, providing such support to our colleagues from Peru," USUE Rector Yakov Silin noted. 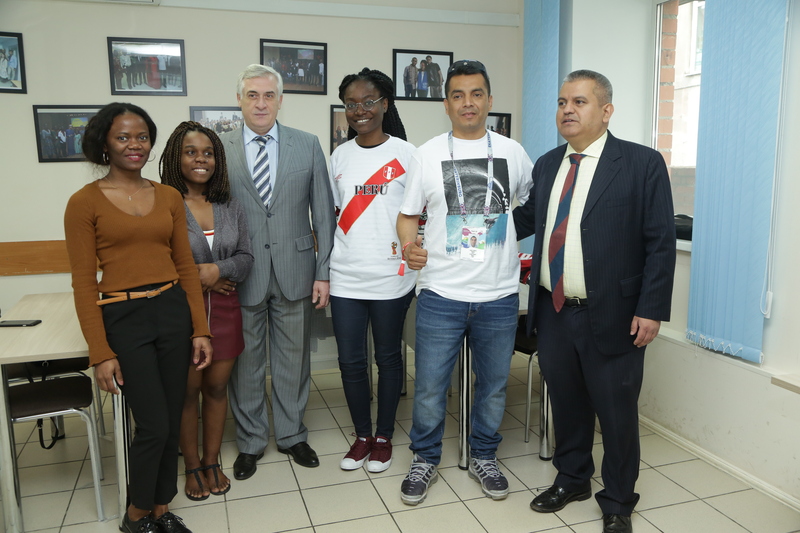 The head of the Consular department of the Embassy of the Republic of Peru in the Russian Federation Fernando Tapia Fernandez-Baca donated a t-shirt and scarf with the coat of arms of the Republic of Peru to the University Museum. Yakov Silin tried on a scarf and admitted that in the match France-Peru, which took place at the Yekaterinburg Arena stadium on June 21, he was a fan of Peruvians. "It is a pity they lost," the Rector complained. The Peru football team has got to the World Cup for the first time since 1982. For the residents of the country, the event became a national holiday. Over 20 thousand citizens of the Republic of Peru came to Yekaterinburg for the World Cup match. A carnival procession passed through the streets of the city. Football fans from Peru shared their impressions, saying that in Yekaterinburg they were warm, despite the weather. The guests learned some phrases in Russian: "Good afternoon", "Hello", "How are you doing," "All the best,” they say in one sentence. “We could practice when talking with the fans of your city. Everyone expected beautiful football and big sports festival."